As a society, we are only just beginning to understand the degree of damage that bullying inflicts on individual teenagers and on their relationships later in life. In this groundbreaking work, James Garbarino and Ellen deLara uncover the staggering extent of emotional cruelty and its ramifications and counter the nursery rhyme that words don't hurt. In this groundbreaking work, James Garbarino, the bestselling author of Lost Boys, and Ellen deLara uncover the staggering extent and consequences of schoolyard bullying and classroom hostility, flat-out contradicting the nursery rhyme that "words can never hurt you." The authors then present evidence that teenagers—hundreds of whom they interviewed—have the solution to school violence, if only adults would listen. Bullying has long been regarded as a way of life. Ever since Columbine, however, student reactions to harassment and intimidation are, finally, driving parents to consider this phenomenon seriously. 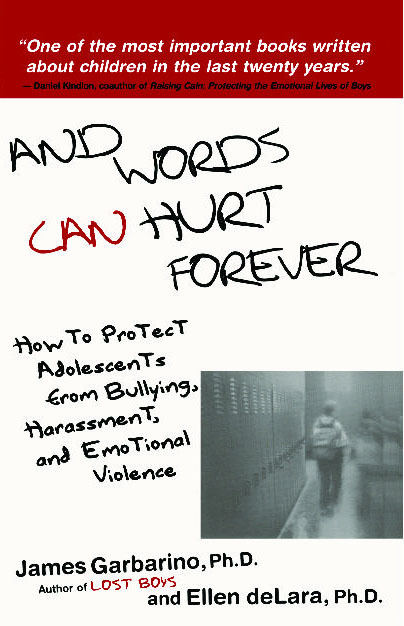 And Words Can Hurt Forever teaches parents to accept reality (bullying occurs daily), challenge old beliefs ("Kids will be kids" or "If I lived through it, so can they"), and ally with other parents to take on the school system. Revelatory and ultimately uplifting, And Words Can Hurt Forever doesn't just highlight the problem, but offers steps that can be taken—must be taken—to solve it. In addition to her recent research on childhood bullying, Dr. Ellen deLara was a Postdoctoral Fellow at Cornell University in Ithaca, New York, where she conducted research with Dr. James Garbarino on child maltreatment at home and at school. Daniel Kindlon coauthor of Raising Cain: Protecting the Emotional Lives of Boys One of the most important books written about children in the last twenty years. Rosalind Wiseman author of Queen Bees and Wannabes An excellent, practical, and realistic blueprint for making every school a safe, nurturing environment. Publishers Weekly Revealing student interviews give depth to [the authors'] extensive knowledge. Barbara Coloroso author of The Bully, the Bullied, and the Bystander A must-read for parents and educators.